Acqua di Gio pour Homme, like Dolce & Gabanna’s Light Blue, was one of those extremely popular fragrances that everybody seemed to wear a few years back. And to my understanding, it is still popular though not to the extent that it once was. And people can easily understand why this one and Light Blue are popular. They’re highly easy to wear and are appropriate for most places the average person would tend to go. In Bottle: While one would have to wonder what exactly a marine note is and how you’re supposed to be able to smell water. Aqua notes, to me, have this sharp blue quality to them. And Acqua di Gio pour Homme does, indeed, have that sharp blue quality from out of the bottle. It also contains something sweet and pleasantly nice to tame that sharpness a bit as pure aqua, to my nose, is very sharp. Applied: Blue aqua notes, sharp and fresh with a sweetness to add a less abrasive dimension to smelling pure water. Smelling aqua is akin to going swimming and accidentally getting some pool water in your nose. That stinging, horrible pain is akin to a too strong, too pure aqua note to me. But Acqua di Gio pour Homme (am I using the word “aqua” enough?_ does a nice job mixing in other notes so it’s not pool water up your nose strong. There is a clear cedarness to this as well as sweetness coming from a rose and persimmon angle. The scent also does a fantastic job incorporating rosemary into the opening and in the mid-stage. The dry down is a nicely sweet, clear patchouli and clean musk. Extra: Acqua di Gio is sometimes referred to as the trailblazer fragrance that ushered in a fad of fruity fresh fragrances that where Acqua di Gio pour Homme is a part of. Design: In a rather plain shaped bottle with a slight curve in the body. The bottle is a pleasant and easy enough thing to hold though grasping the thing in my girly hands is a bit difficult due to its width. It has a metallic cap that slides very nicely into place. Something about the font face or the design of Acqua di Gio pour Homme really slots it very nicely into the Giorgio Armani line of fragrances as the designs do tend to look similar. Notes: Jasmine, rosemary, citrus, persimmon, marine notes, cedar, patchouli, white musk, rock rose. I like Acqua di Gio. I like how normal and completely unexciting it smells. These typical rather normal and inoffensive fragrances are popular for a reason. It’s because they always tend to smell pleasant and easygoing. It also has the benefit of being fairly unisex. 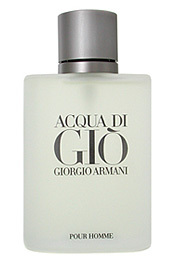 Reviewed in This Post: Acqua di Gio pour Homme, 2009, Eau de Toilette. This entry was posted in armani, aromatic, fresh, Reviews By House and tagged acqua, aqua, armani, di, fragrance, fresh, gio, giorgio, marine, perfume, review, scent, watery. Bookmark the permalink.